On the internet there’s a different pot roast recipe for every day of the week. Some of our favorites: Allrecipes, The Pioneer Woman, Food.com, and The Chew offer some of the tastiest pot roast recipes around. 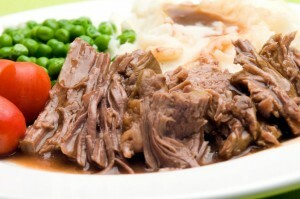 You can always trust Allrecipes, and this simple pot roast recipe is no exception. It’s easy to prepare and cooks in less than four hours with a short list of ingredients. “1. Preheat the oven to 275 degrees F (135 degrees C). 2. Pour vegetable oil into a large oven-safe pot over medium-high heat. Season the chuck roast with salt and black pepper. Brown the meat on both sides in the hot oil, and transfer to a plate. 3. Stir carrots, celery, and onion into the pot, and cook and stir until vegetables start to release their juices, about 3 minutes; loosen any brown flavor bits on the bottom of the pot. Add butter, and cook until the onions are translucent, about 5 minutes. Then sprinkle in rosemary, stir the vegetables, and return the roast to the pot. Cover the pot with a lid. Anyone who loves pot roast needs to know Ree Drummond’s recipe for a perfect creation every time. According to the Pioneer Woman, her pot roast recipe takes about 20 minutes to prepare and cooks in about four hours. It’s an easy recipe to prepare and it serves about 10 people. “First and foremost, choose a nicely marbled piece of meat. This will enhance the flavor of your pot roast like nothing else. Generously salt and pepper your chuck roast. Carrots, potatoes and onions are key to this pot roast recipe from Food.com. This recipe serves about six people. “Place roast into crockpot and surround with vegetables. Combine beef broth and vegetable soup mix, then add to crockpot. Ingredients like thyme and beef broth help deliver a perfect pot roast every time! Preheat oven to 300ºF. In a large Dutch oven add olive oil and heat over medium-high heat. Season meat with Kosher salt and freshly ground black pepper. Add meat to the Dutch oven and cook until browned on all sides, about 7-9 minutes. Remove and set aside. Add onions and carrots and cook until slightly tender and browned. Add the thyme and cook an additional minute. Add the stock, scraping the browned bits up from the bottom of the pan. Add the chuck roast back to the pot and bring liquid to a simmer. Cover the Dutch oven, place in the oven and cook for 3 hours or until the meat is tender. Baste the meat throughout the 3 hours. Visit Ream’s Food Stores for all the pot roast ingredients you’ll ever need!